Beemans gum is back ! It will only be available for a short time. This is one of 3 chewing gums that is made by Cadbury Adams that is only produced for a limited time. Not only that, but it only comes out every 3 years or so. Many ask why it's not available all the time. That is a question we ask ourselves. The only answer I can come up with is supply and demand. About 10 years ago the sales for this nostalgic gum dropped so it was discontinued for awhile, when they brought it back the sales soared. I guess this is a good marketing idea for the company , with it being a limited edition the demand is huge and it sells very quickly. The consumer on the other hand isn't very happy when they can't find their favorite old time gum when ever they want it. Beemans chewing gum as been around for over 100 years. It was actually invented by Dr. Edward E Beeman. He had many patients with stomach and digestive related illness, which he always gave them pepsin as an aid. He invented a pepsin powder which due to a suggestion from his bookkeeper he added the powder to chicle and came out with Beemans pepsin gum. It's slogan was you can eat like a pig, the package actually had a picture of a pig on it. 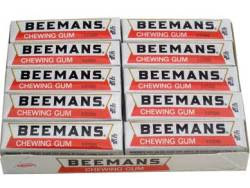 Today I am sure there are some people out there that chew on the beeman's gum to help with heartburn , but I believe most chew it because they like it. This old time gum will definitely bring back some nostalgic memories. Every time this gum becomes available we buy as much as we can get our hands on as the self life is good for approx 1 year. No matter how many cases we buy, it seems we purchase enough. If this was one of your favorite gums you ate as a kid or even as an adult and it is a must have for you hurry and buy yours now as it is selling quickly. We have it available in either just one pack or you can get a box of 20 packs. You can chew till your jaws hurt. Don't forget to also pick up some Black Jack Gum and Clove Gum as these two are also an old time nostalgic gum. I am so excited that the county fair is almost here ! Over the years we sure have had some good times there. Great food, fun games, fast rides and good entertainment oh the memories. 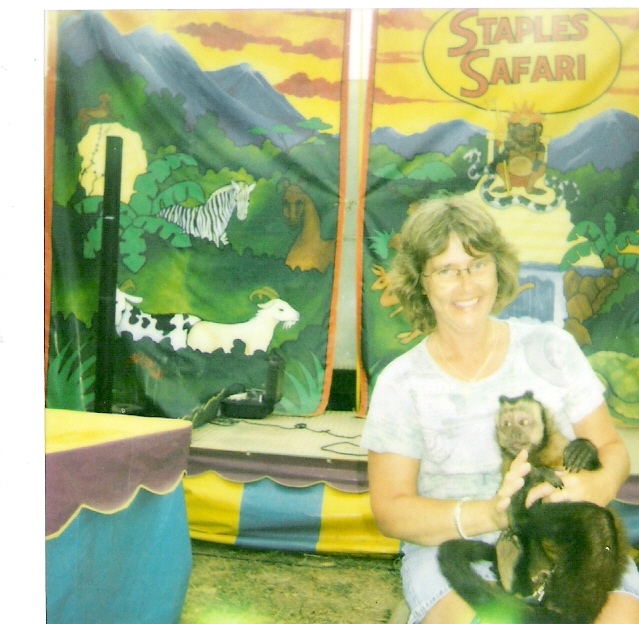 Anyone who knows me, knows I am crazy about monkeys ! My fascination started when I was about 4. As a little girl my dad would take me to Wilson's Variety Store and in the corner with the birds and the fish they had a monkey. Oh I wanted that monkey so bad, needless to say I never got it, however that has never stopped me from wanting one. In 2005 my aunt and I were spending the day at the fair , we were getting ready to leave and of course I had to have my cotton candy before heading home. I purchased my blue cotton candy and went to search for a place to sit. Off to the side there was a show going on so we thought we would go check it out. Well imagine my surprise to find out it was a monkey show. There was the cutest little monkey and boy could he do the tricks. I laughed and giggled as much as the little kids. Near the end of the show they announced they would be taking pictures with your child for $5.00. The show ended and I sat there. I looked at my aunt and she already knew what I was thinking. I waited til there was 1 child in line and got my 5 bucks and stood in line. When the guy got to me I handed him my money. He looked all around searching for my child , then looked at me and said " You want to hold the monkey " my reply was you bet. So I sat down and everyone still standing around was laughing at me, but I didn't care it was a dream come true for me. Now the best part was with all the "other kids" the monkey sat on their shoulders, but I got to hold the monkey I my lap. So I would like you to meet my friend. Many of you probably already know him. His name is Wilson he was the monkey that was in the first Dr. Dolittle Movie. When it was time to give him back I wanted to pay another $5.00 just so I could hold him and play with him a little longer. It was the best 5 dollars I ever spent. I have had a lot of good memories at the fair, especailly when my boys were small and we would all go as a family. I have to admit I was feeling a bit blue that my boys now had a life of their own and jobs they had to go to instead hanging out with me at the fair. It turned out to be the best fair ever. Now there is another thing I can cross off my bucket list. So tell us what your favorite memories of the county fair was. There is just something about food from the Fair or festival. Maybe it's the excitement going on around, maybe it's just that good. I enjoy eating, but a glutton I am not, however the Fair gets me pretty close to it. I have my favorite vendors at each one of the respective events. I believe Italian sausage is my favorite of the normal foods. Normal foods meaning, not desserts and candy. Planning and plotting out the order in which you procure and enjoy these things are oh so important to the success of the mission. I must resist every time, no matter how fantastic the Italian sausage are, because that's where I start, to not indulge in a second one. This lack of willpower will ruin the remainder of the venture. There will be no room for corn on the cob, ice cream, funnel cakes, and cotton candy if you consume the second bomber. If you do, there is a price to pay. You must pace yourself. Sounds like a glutton? No! Just making sure to take advantage of the particular event being that it only occurs once a year. I always save the Cotton Candy for last. Cotton candy is all about the flavor and the fun, really doesn't require a lot of room. By room, I mean the ability to eat a fair amount of it without over doing it. Two Italian sausage or three ears of corn will make you suffer, unless of course, you are a glutton. They say "there's always room for Jell-O". Well, the same holds true for Cotton candy. Being swirled onto a hollow paper tube is the traditional way, just give me a big bag full of it. I eat the Charms Fluffy Cotton candy in a bag from O'Ryans Village, three bags are the usual portion. I love the stuff, being made by Charms and all, the flavor is out of this world. They also make Cotton Candy suckers, how awesome is that? Sucker company makes Cotton Candy, and then turns around and makes cotton candy suckers. We can enjoy the flavor even when the fair isn't in town. Life is good. I really enjoyed the Fairs and such as a kid, I enjoyed them as a young parent sharing it with my kids, and I enjoy them now. It lets me peek over my shoulder and see the great times again that I remember as a child. I sit down to share these stories with people, and sometimes have trouble getting them into words. Those times get my mind racing back. Pretty soon I'm daydreaming about a certain time or place and who I was with. Sometimes it's food or candy, sometimes it's a vacation other times just living life. Us Babyboomers grew up in such a great time, it's just fun to remember and reminisce. My Dad has always been a great story teller, I guess I get the urge to share my life with others like he always has. Thanks for "listening".